I have not been as good about posting updates in recent months as I would like to be, but I could not let today pass without maintaining my blog tradition. 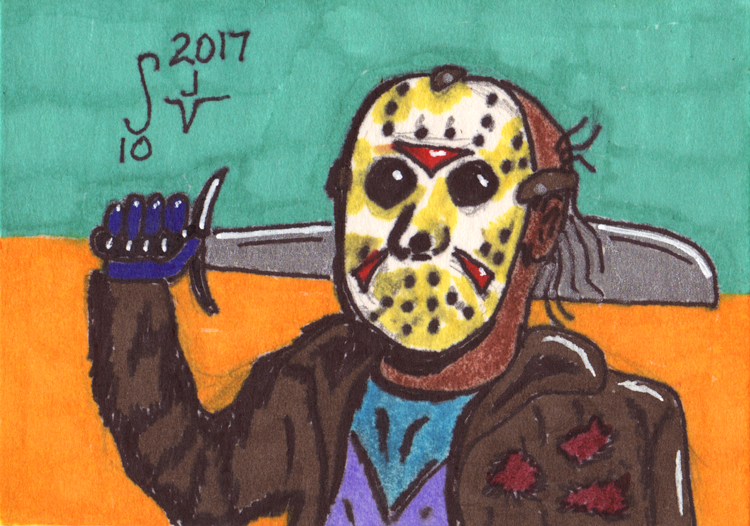 I have posted at least one brand new, specially-themed illustration on every Friday the 13th since beginning the blog back in 2014. Today will be no exception! 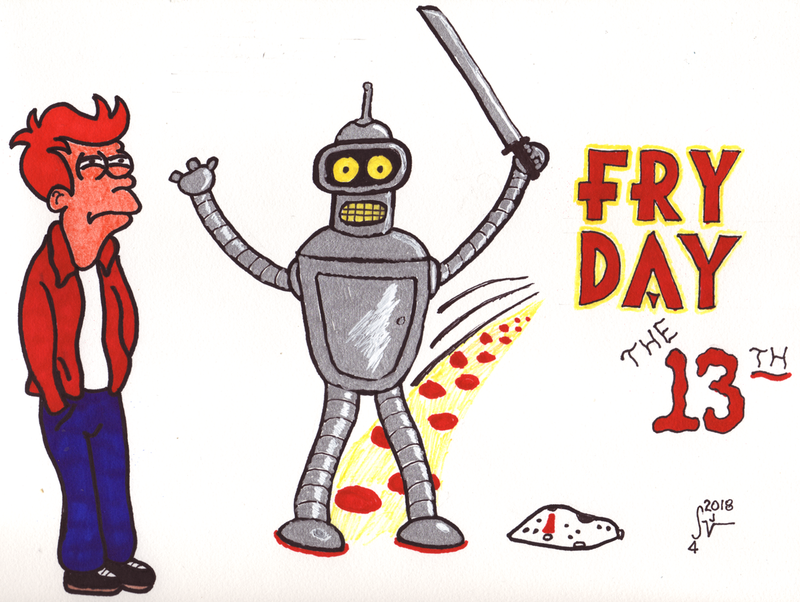 I’m a fan of Matt Groening‘s Futurama and Bender’s cry of “Kill all the humans!” popped into my head this week when I was trying to decide what to draw for today. As you can see, I believe Bender is pleased with himself for having done his best to follow Jason‘s legendary example. Fry, however, seems to be carefully considering the situation. 🙂 This one is completely hand-drawn on Canson 98-lb 9×12-in paper, using pencil + markers to finish. I hope to get back to regularly blogging again soon, and I have a huge backlog of things I’ve been doing that I need to get posted. In the meantime, please let me know what you think of this one and remember, if you’d like an original commission by me or would like to hire me as an Illustrator, please use the Contact page and let me know as much as you can about your request. Continuing with the second week of Inktober, I stuck to producing a new 2.5-3.5-in. 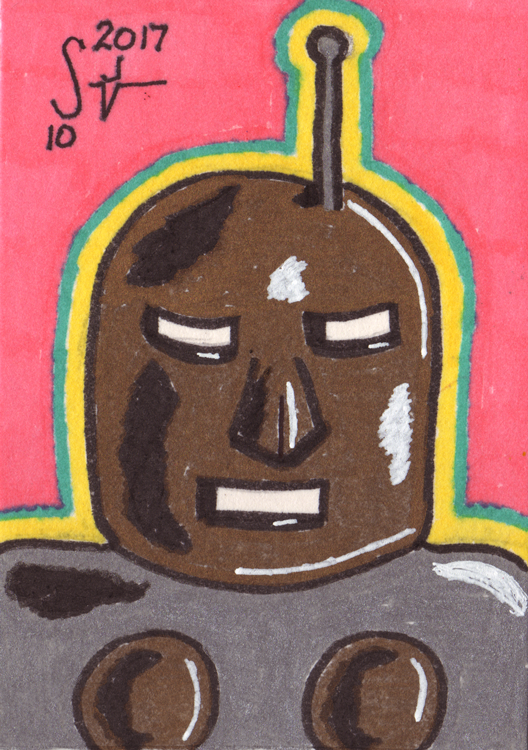 sketch card every day. Check out the Troy Library Mini-Con and Week One posts to see what kicked off the month, and remember to visit the Inktober Web site to learn more about the concept. 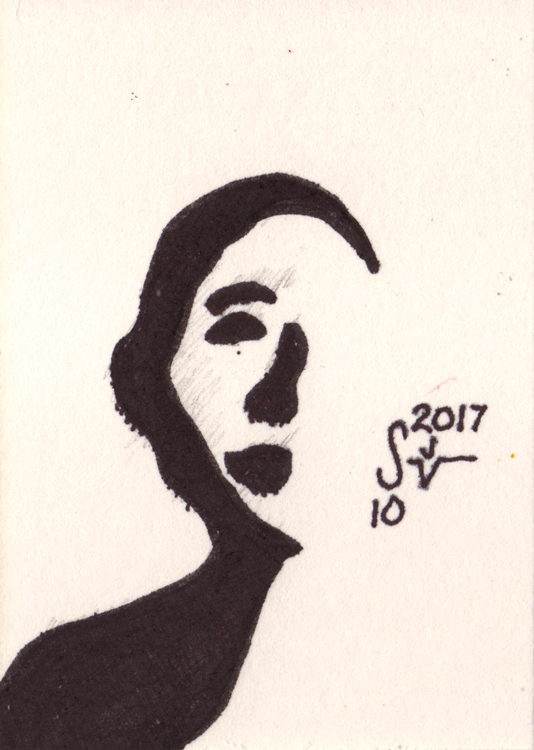 I had fun this week, kicking things off with an experiment in minimalism that I think worked even though it was not what I imagined originally drawing. 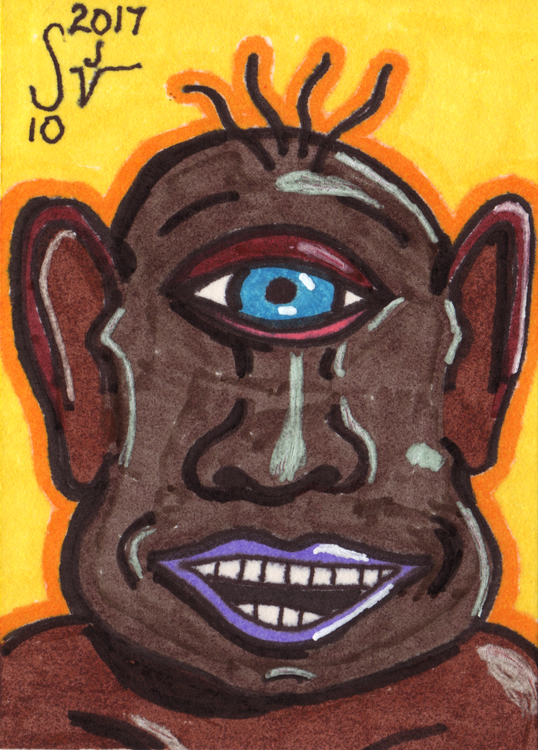 If I had to pick a single favorite card this week, it would be the Cyclops. That one just works in pretty much every way how I wanted it to work. 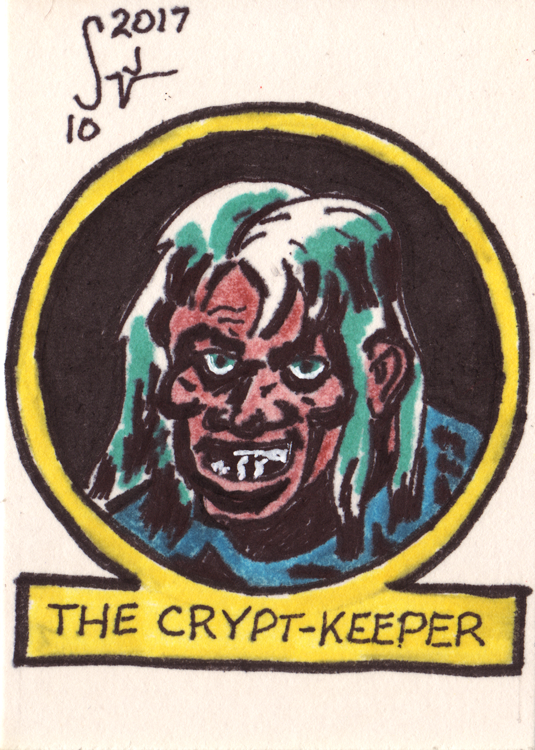 But, I’m especially pleased with my trio set of EC classic host character sketch cards. I am a long-time fan of the classic EC horror comics and I tried to do those in a style appropriate for how they used to appear in the comics back in the 1950s. Those three were also the highlight of my Facebook likes during the week as I posted them, so I must have done something right 🙂 Rounded off the week with a Jason Voorhees card in honor of the Friday the 13th that we had this week. 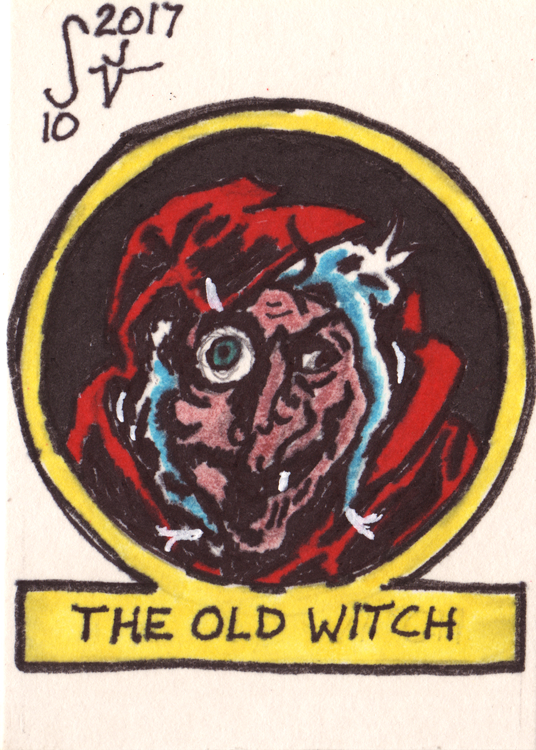 Today I continue a tradition that I began back when I first launched the blog… which is to create a unique drawing of some kind each Friday the 13th. 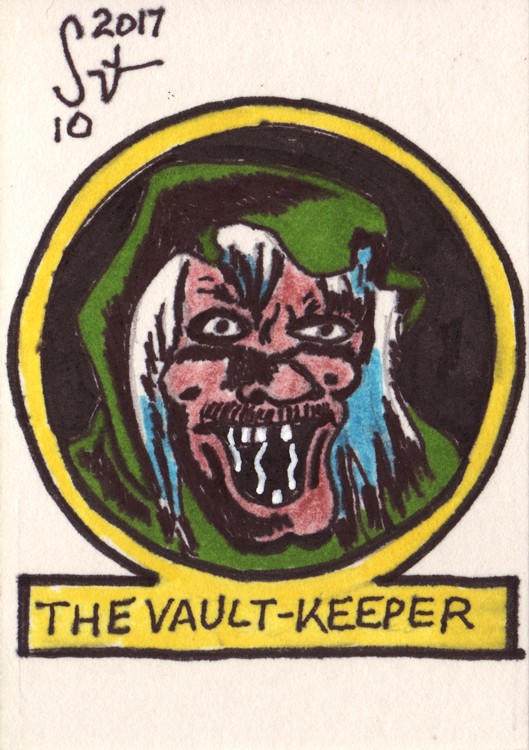 This year I’m throwing a few things into the mix to create a monster mash-up parody. 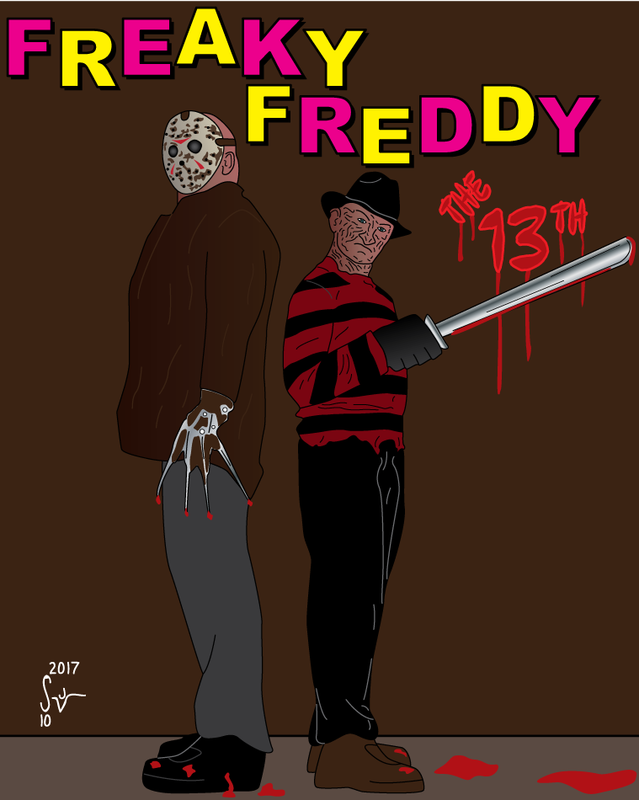 Nightmare on Elm Street, Friday the 13th, and Freaky Friday somehow melt together to bring you Freaky Freddy the 13th! I wasn’t sure how this was going to turn out when I began today, but I like where I ended up with it. Initially I had the guys facing each other… but I think it works better back-to-back. Also, it seemed empty until I started filling in the blood spatters. Strangely, I feel like those really help bring the whole image together even though they were very much an afterthought. Please let me know what you think, and be careful out there today! Also, remember, if you’d like an original commission by me or would like to hire me as an Illustrator, please use the Contact page and let me know as much as you can about your request. *To make up for skipping Thursday and Friday this week, today is a special Saturday two-for with both missing episodes at the same time. Oh frabjous day! In hindsight, they probably read better this way anyway… so accidental success through failure to post them on time.